There comes a time when you may begin to question your sanity. Owning a sailboat will speed up that process with lightening speed. 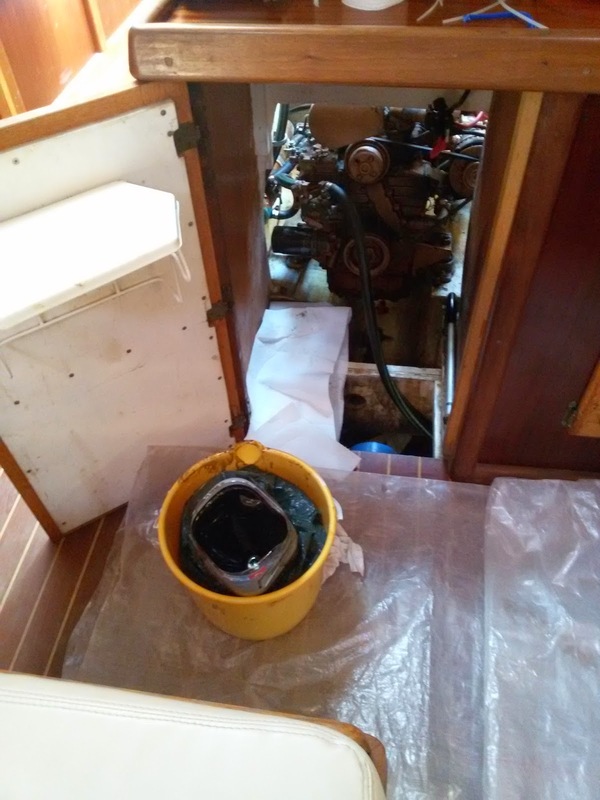 I've come a long way since the days when I used to change the oil and would spill half of it on the cabin sole soaking in multiple layers of paper towels. That's when I had an electric oil suction pump from hell!! In those days I must have also been blind. Even a child could see that the engine sits high enough for an old-fashion oil change - as in unscrewing the drain plug and catching the oil in a container. It took me 8 years to figure that out. Luckily, I'm a bit smarter in other matters of life, or maybe not, as you will soon see. A garbage bag taped to a guillotined water jug makes oil changes a pleasure. But I'm making it sound easy, which it wasn't, not this time. Let me recreate the scenario that would have anybody question their sanity. You know, when your start repeatedly asking yourself "am I going f*** nuts or what?" After draining the oil and removing the old filter without spilling hardly a drop, I realized I had no replacement filter. Can't be! I'm sure I saw it in here with all these fuel filters. Maybe it's at home. I bought three of them, I'm sure I did. After rummaging through every single storage area twice, there was nothing to do but go buy a filter at the tractor parts store, actually two for €13. ...what's this? 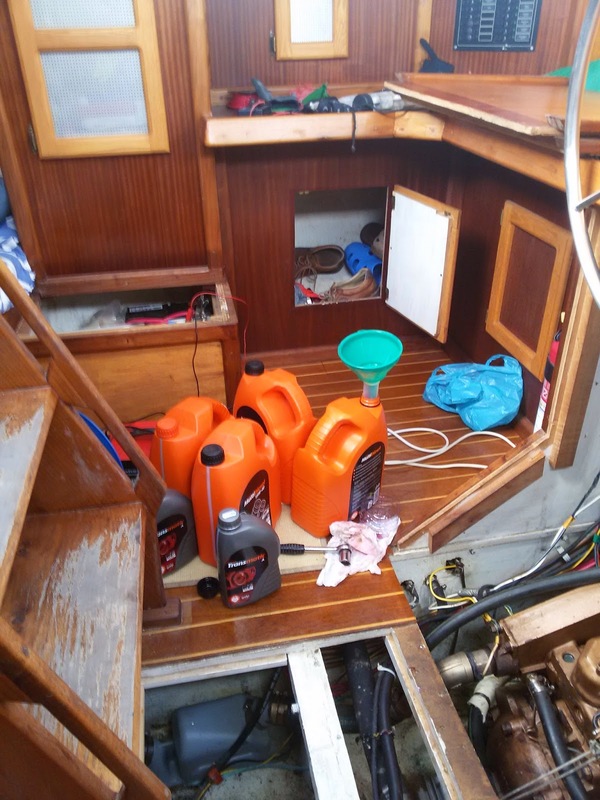 I have three oil jugs on the boat and ALL THREE have about 1.5 liters each. You mean I've been carrying these jugs around for a year, have actually picked them up probably 50 times to get at tools and never noticed that they were almost empty. And more importantly, why do I have 3 jugs each with 1.5 liters of oil. Oh man, I need to see a boat shrink. I'm still puzzled even now as I write this. Weird, weird, I tell you. But I have money. I know that for sure because I opened my wallet and there it was: three twenties, a ten and a fiver. So off I go to Intermarché (a grocery supermarket) for a jug of Galp 15W40 diesel oil that cost €19.99. Four 5-litre jugs of oil, you'd think I have a 300 hp engine. So now I have a leftover jug with 1.5 liters to start the collection all over again. The transmission was next. I had some Galp Automatic transmission fluid, Type A, but I already knew that. No messing with my head there. I did, however, get the math wrong and poured too much fluid in, which I removed of course. 280 ml + 420 ml = 560 ml??. Yeah, I better see the math shrink too. I used to be brilliant in math. I also used to be normal before I had a boat. Ana doesn't call me Martelo Godzulo for nothing. Math?? Yeah, that rings a bell. I've cried looking for something on the boat. I even made a log of what I've got and where. Now I can't find the charger/transformer for my B&D cordless drill. There is no god! How I envy easy assessed engines. Mine is only from the top. Let your imagination go wild! I could use a shrink to save me from the enslavement, but a pump to get all the blood out of my head would make me feel better. ps.... my jug collection is epic! Yeah, once upon a time I also made a drawing showing all the storage areas and listing their contents. The first list ran right off the page and so I gave up. Working on your engine upside down is no fun...have you ever thought of teaching your feet to handle wrenches? ?